http://bookriot.com/2015/01/26/best-feminist-picture-books/ She prefaced this by saying, ‘this made me think of you’. Twenty-three years ago my wife and I had our first child, a daughter. As a dad it was important to me that the stories we read didn’t follow the standard formula of the handsome prince saving the girl in the tower. As a new dad I asked our local librarian to recommend books where the girl was the hero. She said there weren’t many books like that but a new book had crossed her desk ‘The Paper Bag Princess’. 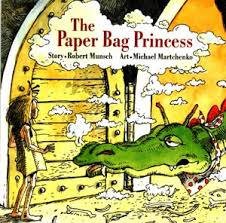 The Paper Bag Princess is the story of a princess who’s had enough of waiting for her knight in shining armor, she takes off and vanquishes the dragon and then decides the prince (whom she rescued), is not worth her valuable time after he makes a rude comment about her appearance. I thought, ‘this is the kind of book I want to read to my daughter!’ One of the qualities that attracted me to my wife is that she is a smart, strong, independent woman. In raising our daughters (another daughter would follow a few years later), our goal was to raise strong, adventurous, socially conscious young women. The Paper Bag Princess was a good place to start. Twenty three years later our two daughters are launched. One is living and working in Los Angeles as she pursues her passion and the other is studying for a semester in Ireland with adventures ahead. Both are setting their own course and inspire me. We continue to live in an a world that is too often sexist and misogynistic. Yet we’ve made progress in the last twenty years. In a recent listing of The Best Feminist Picture Books, there are many more books to inspire girls and boys to follow their dreams. Good Topic, and quite bright for todays standards.